Truth or myth: quinoa is a good source of protein. The answer may surprize you. Before we dig into the story of quinoa and protein, here’s some information about quinoa that you may find interesting. Quinoa (pronounced KEEN-wah) is a grain crop grown for its edible seeds. It is a pseudo-cereal. It is not genetically modified and is naturally gluten free. Most quinoa is grown organically. Quinoa is a whole grain high in fibre. It contains some iron (although I wouldn’t consider it a high iron food), magnesium, and other nutrients. You’ve likely heard that protein is essential for good health. It is required for energy, muscle repair and to increase immunity. The building blocks of proteins are amino acids. There are 20 amino acids, nine of which are called ‘essential’ because the human body cannot produce them – so it is essential that we obtain them through diet. Foods that contain all nine essential amino acids are considered a ‘complete protein’. Animal-source foods are complete proteins. However, very few plant-source foods, even those with lots of protein, contain all of the amino acids. Quinoa - Good Source of Protein? Back to our original question: is quinoa a good source of protein? The answer depends on what you mean by a “good source”. Do you mean good quality or a large quantity? Quinoa contains all the nine essential amino acids. It is one of the few plant-based complete proteins. However, quinoa does not contain a lot of protein. One cup of cooked quinoa contains 8 g of protein. So, quinoa contains good quality protein, but only a moderate amount of it. Tip: Saponins naturally existing on the surface of quinoa can cause stomach irritation. Rinse quinoa well before cooking it to remove the saponins. While some of the quinoa on the market has been pre-washed, this isn’t labelled. So to be sure, we recommend washing your quinoa before cooking. 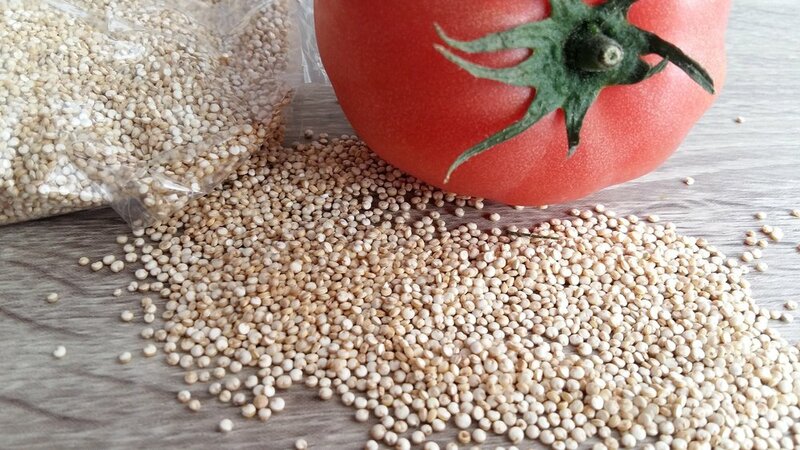 Aamina: Quinoa is a complete protein source for pregnant woman, athletes, children and adults. Apart from providing protein, it also lowers blood sugar and cholesterol levels. Hence it can be consumed by people with diabetes and high blood pressure (hypertension). In my view, quinoa is beneficial for health of every one of every age. Kristen: As a whole grain, with good fibre and other nutrients, quinoa is a healthy food. I generally recommend that adults aim for approximately 20 grams of protein at a meal. At 8 grams of protein per cup, you would need to eat a lot of quinoa to reach this target. Quinoa also contains a lot of carbs. 2 cups of quinoa will be too many carbs for most of us. Therefore, I recommend quinoa as a healthy starch choice. But you will want to pair it with another high protein food, such as beans, lentils, nuts, or seeds to get sufficient protein. Thank you to volunteer Aamina for her research and writing contribution to this article. Photo credit: Susana Martins on Pixabay.